My gorgeous middle child just turned 6 and for his special day he wanted a Minion Party based on the Minions from the movie Despicable Me. 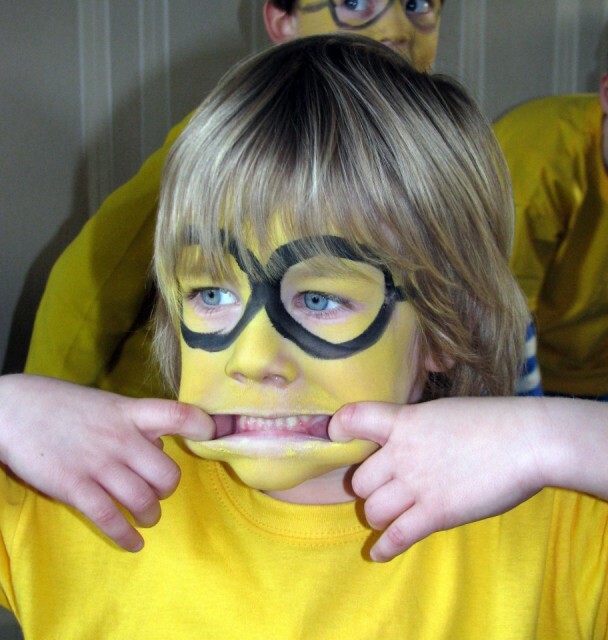 Here are some ideas to use when planning your One in a Minion party. We did some of these activities but not all, I’ve included all the ideas I found when organising the party so that you have a wider selection to choose from, Tank Yu! Pin the goggles on the minions. You need a picture or poster of a minion and some goggles but from paper. 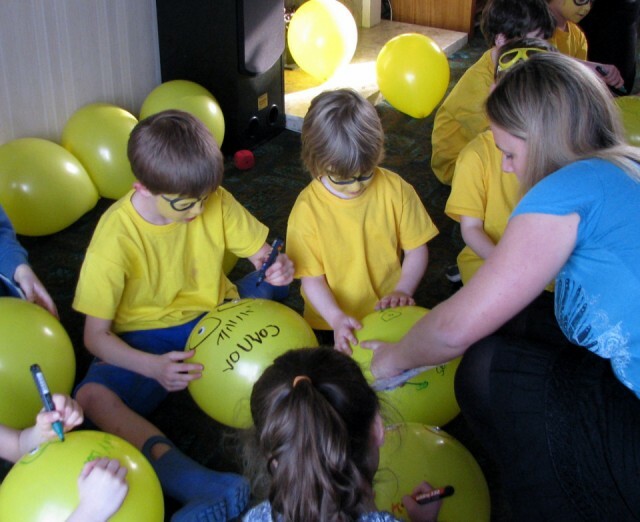 Children have to stick their goggles to the picture whilst blindfolded. Pin the pointy nose on Gru. As above, but you will need a picture of Gru and a selection of noses to pin onto it. Pin the tail on the fluffy unicorn. As above but this time you provide a few tails for the guests to pin to the unicorn picture. 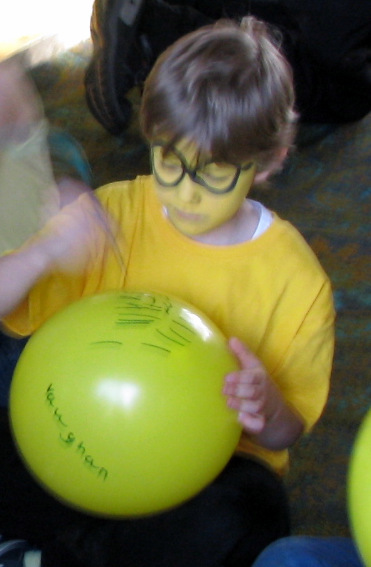 Draw a Minion face on a balloon using a marker pen. Children can take these home afterwards. Provide a lot of sharpies and a large yellow balloon each. Steal the Moon – The person who is it would be Gru. Use a ball that Gru will be holding that is the Moon. All of the other party guests must catch Gru who then has to hand them the moon and sits out. The new Gru then runs away whilst the others try to catch him. If the Moon falls it is up for grabs and anyone can Steal the Moon. Continue playing until you have a winner. Annoying Sound Contest – In the movie when Gru is telling the girls Margo, Agnes and Edith his rules one of them is No Annoying sounds. Have your guests break this rule by showing you the most annoying sounds they can make. A variation of the annoying sounds game is to have someone be Gru. Have Gru sit with his back to the group. Select someone to make an annoying sound. Gru tried to guess who made the sound. If he guesses correctly, the child who made the sound becomes the new Gru. Fluffy Unicorn – Gru takes the kids to a Carnival and Agnes see a Fluffy Unicorn and says “Its so Fluffy I’m Gonna Die” . Gru has to win this by knocking down a Spaceship. Make a spaceship from a bottle and construction paper, then using a Nerf gun have the kids take turns to see who can knock it over. If you do not like using Guns than just use Balls you can throw. Shrink Ray – in the movie Gru has a Shrink Ray Gun. This is a fun game you can play outside on a hot day. Give each guest a Water Gun (Shrink Ray Gun) – You can find many inexpensive ones and if you write their names on it with permanent marker they can take it home as part of their Party Favor. On “go” they must run and try and get each other wet. If a guest has been hit then they must Shrink – Kneel Down or Ly Down where they got hit and they are out. Keep playing until all your guest have been Shrunk but one. Gru Says – Playing this game just like Simon Says, but Simon is Gru and the Party Guests are the Minions. You can be Gru or have the kids each take turns being him. Have all the Minions follow what Gru Says, but if they do not say Gru Says and they move – they are out. Keep playing until you have a Winning Minion. Freeze Ray – Another fun gun Gru has in the movie is his Freeze Ray Gun and this freezes anyone he shoots. Divide the guests up into two teams. To know who is on which team give them all a piece of coloured fabric/ribbon you can put on them. Then on “go” each team must try and Tag a person from the other team and if they do that person must FREEZE in place. The only way to get un-frozen is by having another one of their teammates tag them. Keep playing until one team is completely frozen in place. (this is based on the traditional “stuck in the mud” game. Learn to speak Minionese: have sheets of Minion language and teach the children to say some of the phrases from the film. Try to use some of these phrases during the party and see how well the children respond. Musical Minions – Musical Chairs, but instead they guests are playing Musical Minions. Set up your chairs and use your Despicable Me Music. Musical Minion statues: children have to freeze in their funniest poses each time the music stops..have camera ready for fab silly poses. 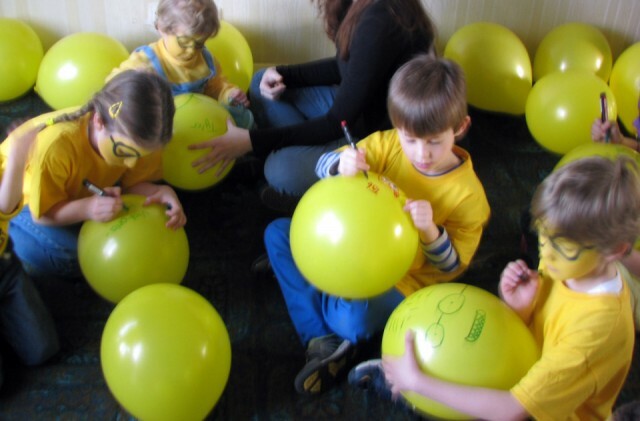 Decorate a t-shirt, buy yellow shirts for all guests. Have the children decorate them or do iron on transfers of minions or I love Minions or something similar. Each guest wears their shirt for the party and gets to take it home after. Treasure hunt for bables and bananas. Hide real/toy/paper apples and bananas around the party space. 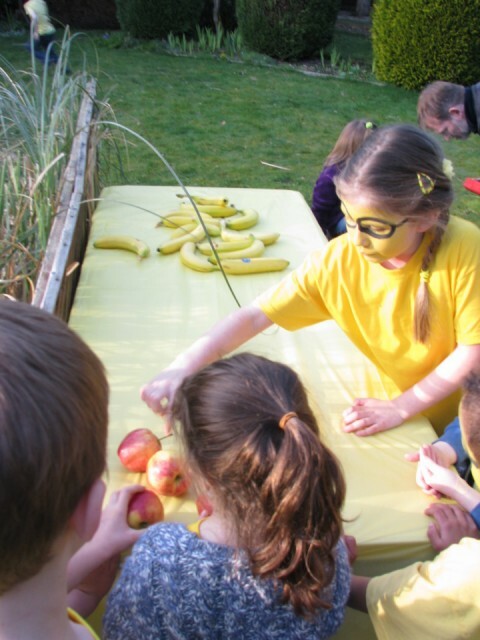 Divide the guest into two teams-have them race to find either the bables or bananas -which team will be quickest to find their fruit? Make minion cutout on paper and laminate them. Divide the guests into two teams. 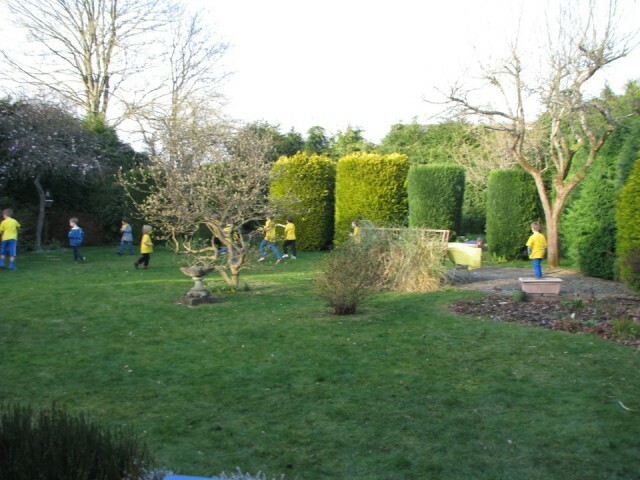 Have team A hide the minions and team B find them and then swap over. Time them to see which team finds all the minions the fastest. Make minion masks from yellow paper plates and circle shapes for goggles. 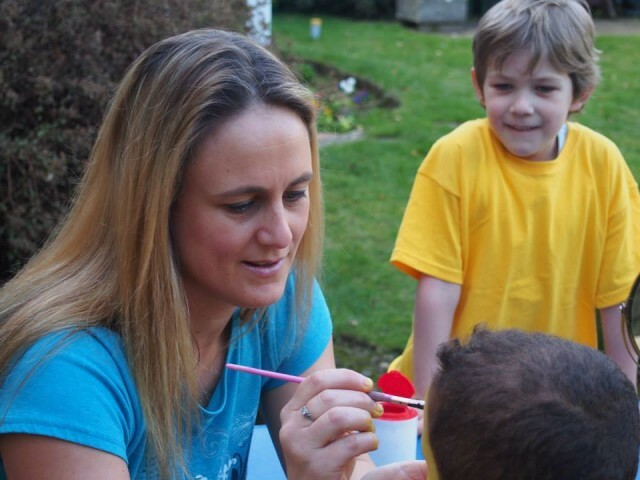 Face paint: Paint each child’s face yellow when they arrive, complete with goggles around the eyes. Simple, quick and effective. 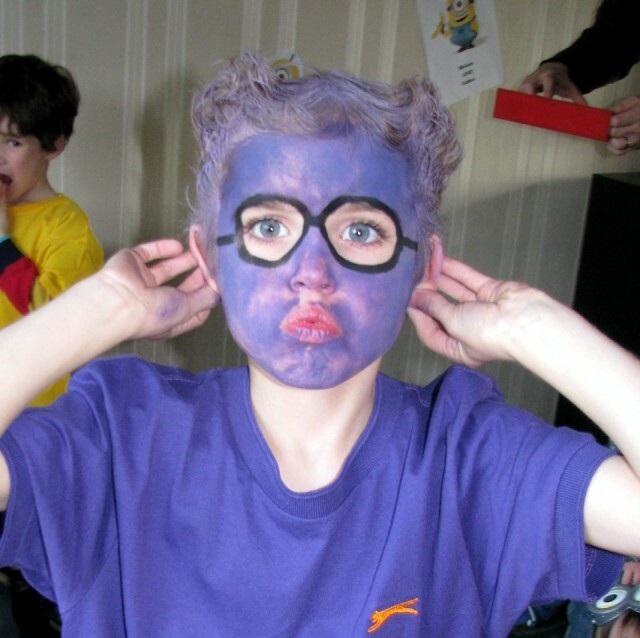 Of course, you can see I had some who came as the purple minions, so I did their faces purple instead! Story Time – Have some fun sit the kids down and read them the book Gru read to the girls at Bedtime. The book is called Sleepy Kittens. 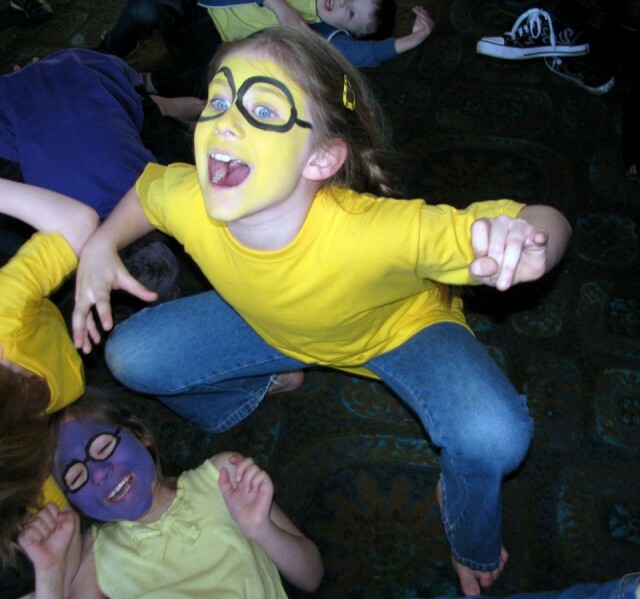 A Minions party is a super theme for kids. Minions are funny and silly-a perfect combination for parties. Have fun with the wacky things minions do and combined with some fun food ideas, decorations and minion party games and activities, you will put on an event that is sure to have all your guests smiling!